Obama hits Romney on Seamus – POLITICO.com. OSKALOOSA, Iowa — President Obama strayed from his prepared remarks here Tuesday to get in a jab at Mitt Romney’s famous dog-on-top-of-car moment. Noting that the Republican candidate has criticized wind energy, saying a windmill can’t be put on top of a car to power it, Obama had a zinger. Decades ago, Romney put his family’s dog, Seamus, in a carrier on the roof of their station wagon for a trip to Canada. The incident was the source of much mockery during the Republican primaries and, apparently, in the general election. Dogs strapped to the roof of their car, and now horses drugged out of their minds, what is it with the Romney’s and animals anyhow? via The Immoral Minority: Dogs strapped to the roof of their car, and now horses drugged out of their minds, what is it with the Romney’s and animals anyhow?. 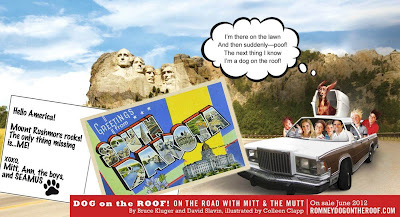 UPDATE: Our friends over at Dogs Against Romney will be helping to launch the new book DOG ON THE ROOF: On the Road with Mitt and the Mutt! Dogs Against Romney will be coordinating with Touchstone/Simon & Schuster next month to help with the launch of the new book, DOG ON THE ROOF! 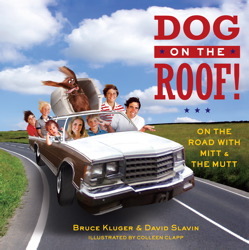 On the Road with Mitt and the Mutt by political satirists Bruce Kluger and David Slavin, with illustrations by Colleen Clapp. 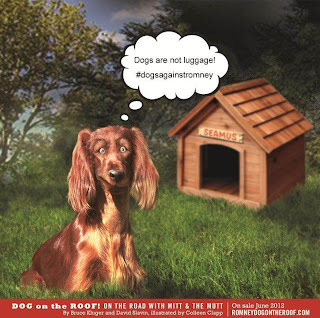 via Dogs Against Romney: Dogs Against Romney Coordinating with Touchstone/Simon & Schuster on Launch of DOG ON THE ROOF: On the Road with Mitt and the Mutt.